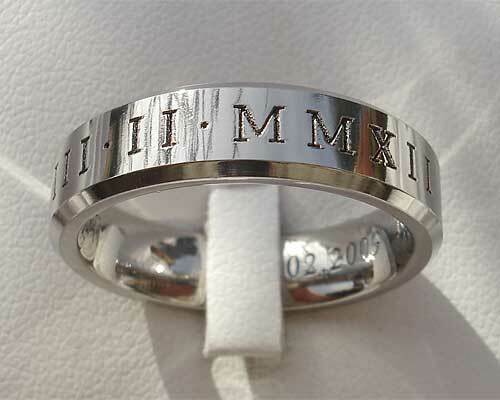 Roman Numerals Wedding Ring : LOVE2HAVE in the UK! 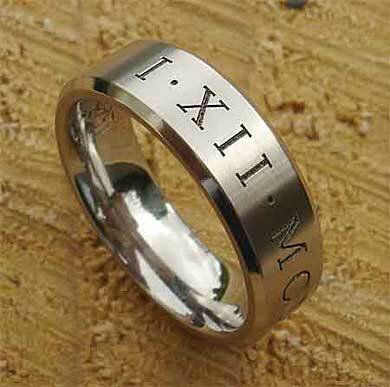 Here we have a Roman numerals wedding ring in titanium that is available in a polished or a satin finish. The shaping is a flat profile style with chamfered edges, and outside engraved in Roman numerals. 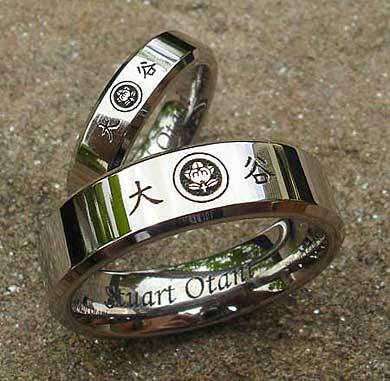 The design is straightforward, yet classy enough, which is what most people require for their plain wedding rings with their very own unique dates or even customised messages. The engraving is beautiful and deep so lasts and won't wear away. The ring is available too in widths ranging from 5mm through to 10mm. We have pictured for you on this page some matching sets in 5mm and 7mm (his and hers), and as you can see we can also engrave logos too as pictured below also. We can say that this ring offers you excellent value for money for your wedding ring choice. 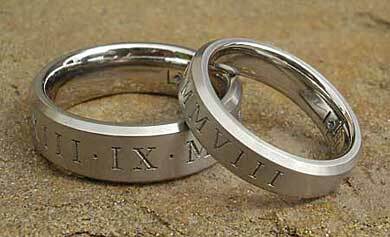 All our Roman numeral rings make brilliant personalised and also matching wedding rings. You can decide what you want in Roman numerals on your ring. The personalised Roman numerals engraving included in the price is FREE! - Just enter your requirements into the comments box at check out. We can translate the date for you if you are unsure. 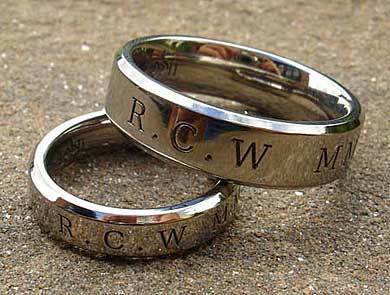 You are not limited to Roman numerals or dates we can engrave anything you like. Width(s) Available: 5mm to 10mm. Returns Policy: This item is personalised and made to order so, therefore, non-returnable unless faulty or not as described. Please see our terms and conditions.